With the fall fast approaching, the time to think about your holiday eCommerce strategy is now. With some pre-planning, your eCommerce store can display holiday themed CSS and layout that you can prepare now and automatically display for each holiday at the end of the year. Once your create and test your holiday theme, you can set dates for each of them to take effect. This method of theme override will be using Magento’s Design Fallback Hierarchy and the “Design Change” section of the admin. I think of the Design Change section of the admin as an override of the System->Configuration->Design section (where you normally set your theme and package), and because of this, I only need to put changed files in this theme. I don’t need to copy any template or layout files that appear in my standard theme. If there is a Design Change specified, Magento will look in those files first, before reverting to the standard Design Fallback Hierarchy. So, it will look for requested files in your holiday theme, then your custom package/custom theme. If it’s not located, it will move on to the custom package/default files, then the base/default files. This hierarchy is important because it allows us to modify only the files that are necessary to create our holiday theme, and allows everything else to fall back to our standard theme. To begin, we need to create a theme for the first holiday. Let’s use Halloween. I will create my Halloween folders in both the skin and app directories. In the skin directory, I create the Halloween folder and then I will create folders for CSS and images inside of it. 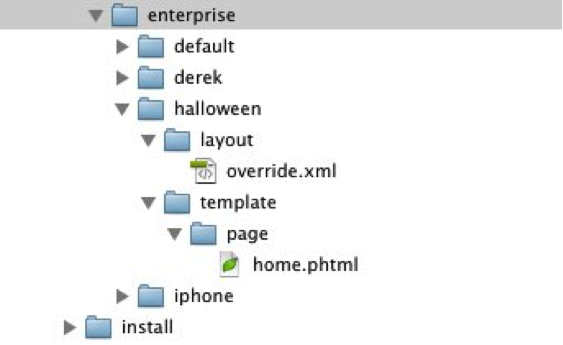 In the app directory, I create my Halloween folder inside of the Enterprise package (you can put this file inside of whatever package you are using for your default theme). I then create folders for layout and template inside of it. In the CSS folder, I will create a file called “styles.css.” In order to make sure that the other styles of my theme are included in my Halloween design, I will call an import at the top of the CSS file that will include all of my original styles from my standard theme. By putting my holiday styles under the import, I am overriding any existing styles with holiday styles. I am importing all of the styles from my default theme, and then adding some simple Halloween styles after it. 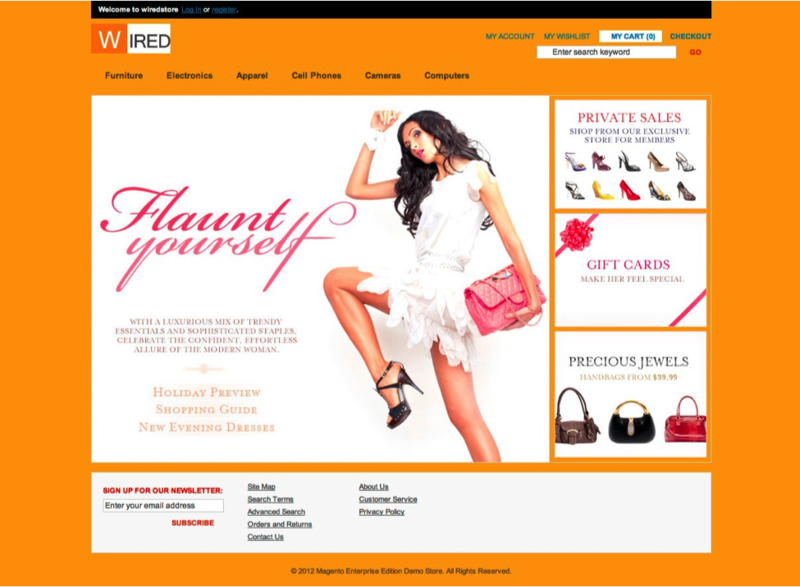 We will test this CSS by adding a Design Update in the Magento admin. 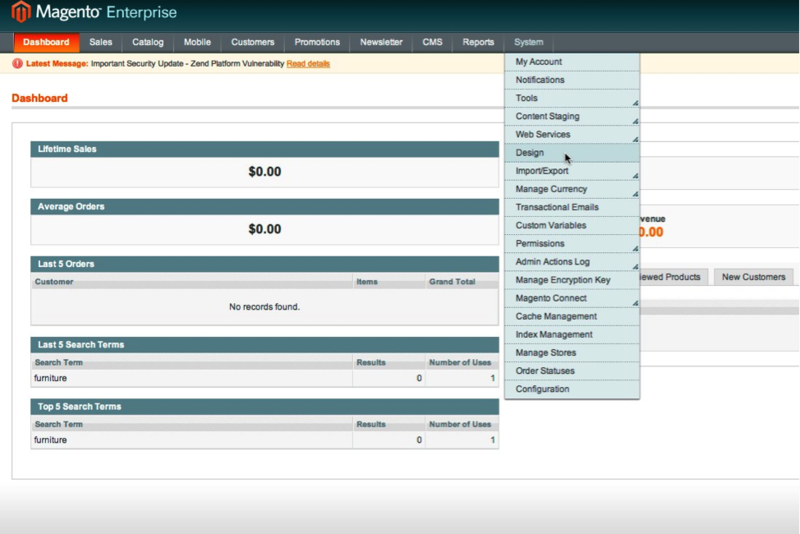 From your Magento Admin Dashboard, navigate to System->Design and click the “Add Design Change” button at the top right. From the “Custom Design” dropdown, choose the theme that you want to test and select today’s date to enable the Design change. Upon refresh, I will now see my Halloween styles. Notice that all of the existing styles from my default theme are still in effect, and I am simply overriding the styles that I want to update for this holiday. If we need to make layout updates to our theme, for example, calling different banners or page templates, we would normally make changes to our local.xml file. But because we are trying to create a holiday theme that will stay up to date with our standard theme without copying files, we need a way to include our local.xml updates from our standard theme while including layout updates for the holiday theme. We can do this by calling an additional XML file after local.xml. Doing this requires a core update, so we need to go to app/code/core/Mage/Core/Model/Layout, open Update.php, and copy the file. We will add it into the local code pool. I've created the copy of the file at app/code/local/Mage/Core/Model/Layout. Now, I create an override.xml file in my Halloween/layout folder. To test my file, I am going to add some simple layout updates that will target the home page. I am going to remove the cms wrapper, create a new template file for the home page, and call a new static block within the template. I created a new static block in the admin that contains a Halloween banner and has the ID “halloween-banner.” I then made a new template file for my home page in Halloween/template/page and called my static block within that template.